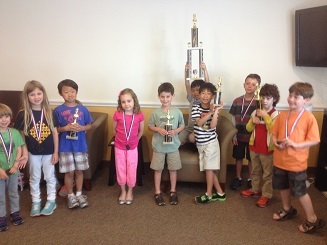 Every section of this month’s K-8 Scholastic Championships were extremely competitive. 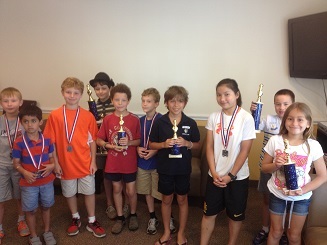 In the K-2 section it was Leo Zhang who took first place honors with a perfect 4-0 score! 2nd-5th place went to Caleb Klenoff, Jack Cole, Cooper Lee and Tony Zhu. CCFC Director Melvin Patrick made gave special recognition to the entire section of K-2 players for their incredible display of sportsmanship throughout the tournament! The K-5 section was won by Nathaniel Valdivieso by a full point ahead of the field! 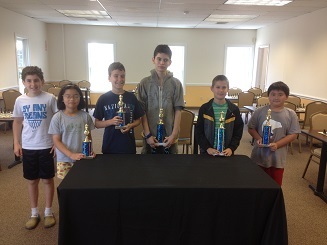 Daryl Lavin, Isabella Hall, Giacomo Lowenstine and Max Feldman finished 2nd – 5th respectively. Rating favorite Liam Kaufman faced many tough opponents and hard fought games, but managed to win 4-0 none-the-less. 2nd – 5th went to Filip Graham, Joseph Ho, Beatrice Low and Mark Yukelis. Thank you to everyone who participated and made this a very memorable tournament!